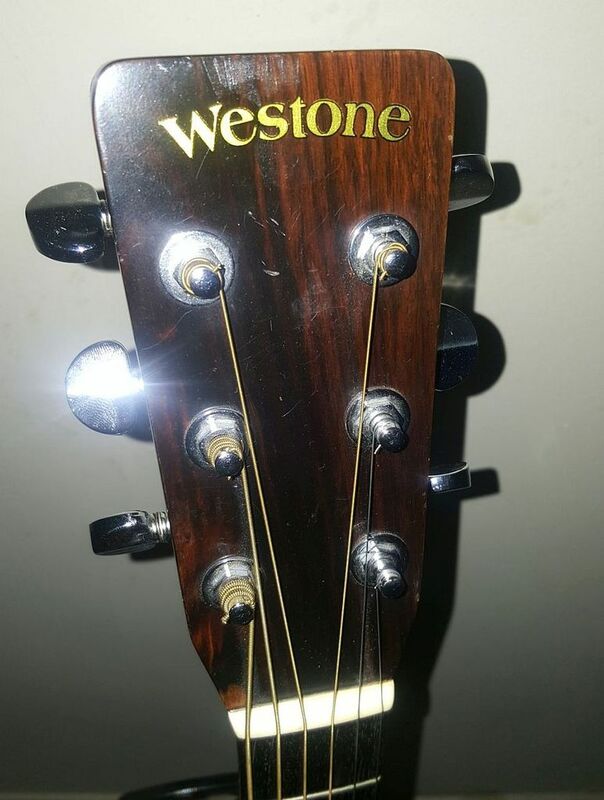 I need help about my westone guitar. I bought it online, and I am interested if when and where it was made. It is an acoustic good sounding guitar and I really love it. 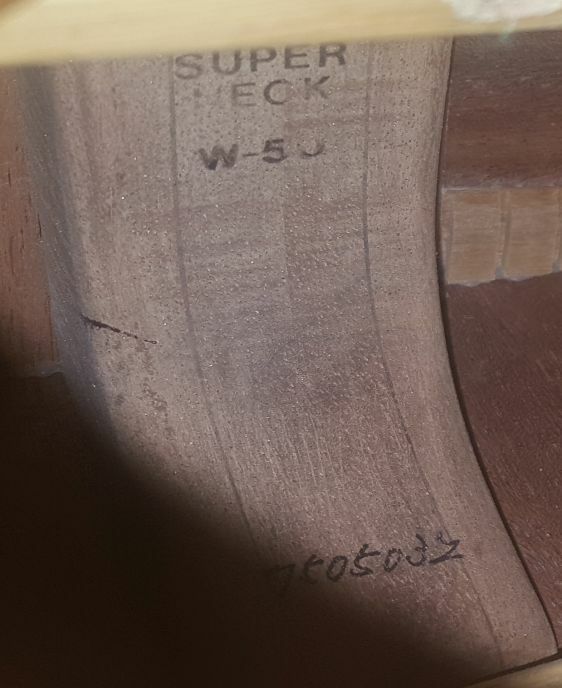 It has label of of Super Neck W-50 and a serial number of 750503Z. I got it with the hard case with a Hiragana symbols. Very much appreciated all your responses. We don't have a lot of information on Westone acoustics but I am not aware of a Matsumoku made model W-50. The serial numbers from the era that we concentrate on do not end in a letter so my suspicion is that yours is Chinese or maybe Korean made. Thanks for the reply, really much appreciated. 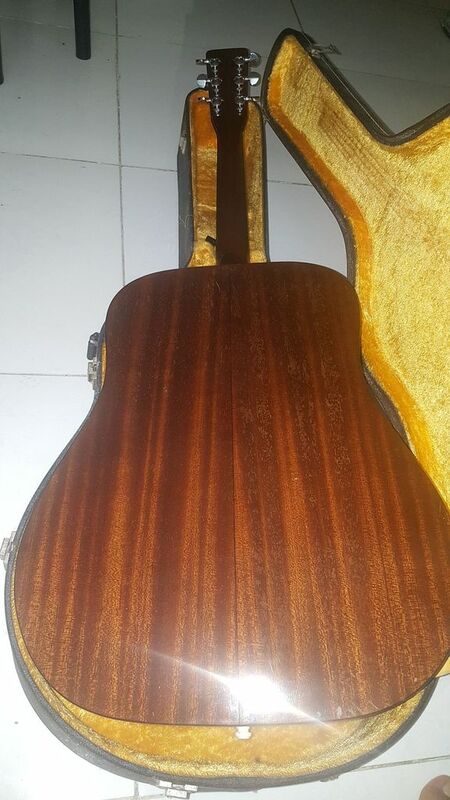 I got my guitar from a trader, where all his stuff are coming Japan. As i mention it has a name Ginoru printed on the hard case which is a Japanese name. If yours is Japanese/Matsumoku made it might be another model that we have not known about. However, that serial number doesn't sound right for the 70's era. The first 4 digits are usually the year, and 750503Z would not fit that pattern. And there were no letters used, so the Z doesn't fit with what we know either. Please post some detailed pictures when you can. Thanks for sending me the pictures Benjo. Very interesting. This looks generally like a Matsumoku built guitar. Certainly, it has that Mats "super neck" design element. However, the general build materials don't seem to fit into the expected model range that we are currently aware of, i.e., W-20, W-30, W-40. This range of models uses more expensive woods and more elaborate finishing as the model number progresses. So, my expectation would be that a higher number would use very high end materials an even more ornate finishing and decoration. That isn't the case with this W-50. It appears to be a more modest build, closer to the W-20. Kinda confusing. Acoustics normally have a paper label indicating the model number, serial number and manufacturer (Mats). 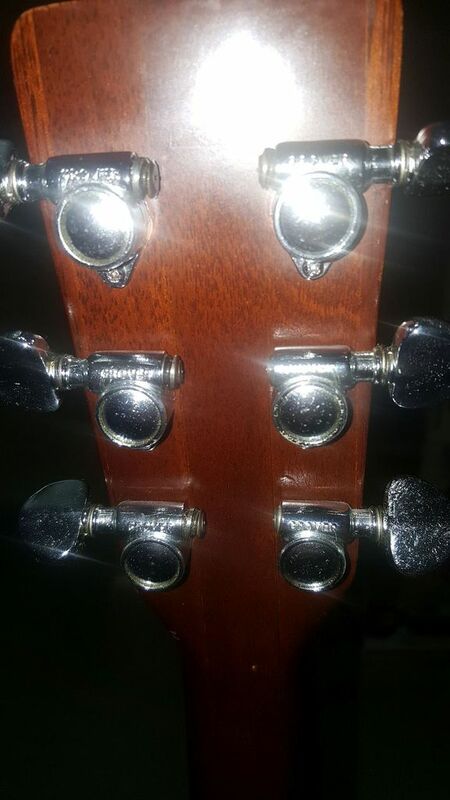 This guitar has a rubber stamped model ID on the neck with what appears to be hand inked serial number. By the way, I interpret that last digit as a "2" rather than "Z". I think that makes better sense. The numbering on this W-50 departs from what we're accustomed to on 70's acoustic guitars. Normally, the first 4 digits are the year, in full, e.g. 1974xxx, 1976xxx. 7505032 looks more like what we used to seeing on 80's Westone builds. So how to interpret? Is this a 1975 build or a 1987? Benjo, when you are able to post your own pictures, could you show the back and sides please? Also can you confirm that there is not a paper label inside? Thanks for bringing us this model. Comments please from the membership. 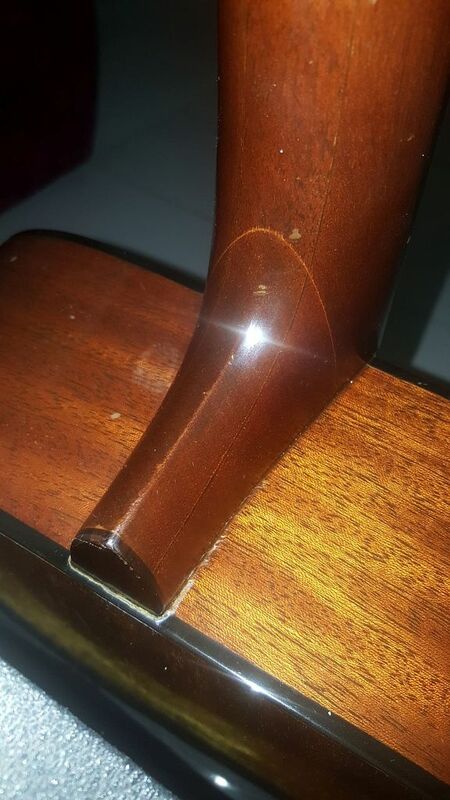 As mentioned before this is a very much an entry level build compared to the other known models in this series: Mahogany sides and back, black plastic purfling, plain dot position markers, and no back inlay. 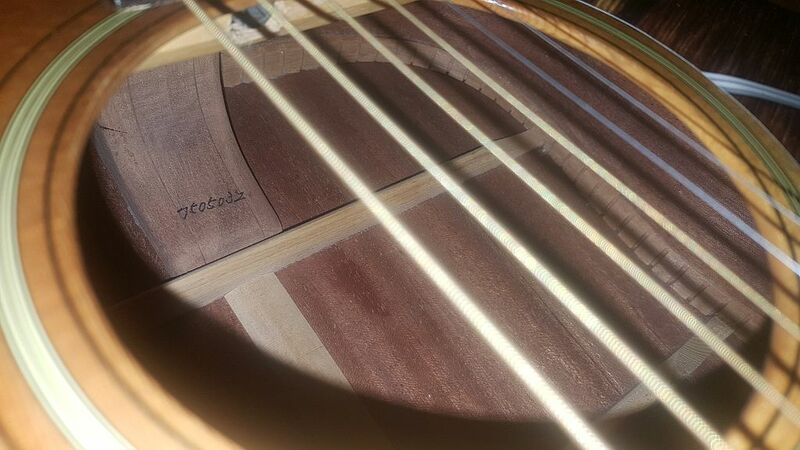 It does have a small design inlay on the bass side of the bridge which is unusual. Anybody have any ideas or comments on this model? What year do we have here? ..... yet another anomaly in Matsumokus' ever-growing list! Thanks a lot for all your reply and taking time. Yes , it is really a nice and good sounding guitar. Now, I can even tell to my kids when they grow that we have a guitar that is more older than their father. Thanks a lot Barry and more power. Could do with the tuner buttons being nipped up. Now that you mention it Dan, this W-50 has more in common with the SW-25 on our site. Similar construction and appearance. But again the numbering designation doesn't fit. The build quality in the SW series also increases as the number goes up, so this guitar really is a head scratcher. The number is only stamped on the 'super neck' that doesn't mean to say it's a W-50 model for one there's no inner label.??? All the 'super necks' were more than likely the same, some with different inlays/binding. I'd disregard the stamp on the neck. None of the other models with the SN have a stamp looking at the photos??? Anyway if you like the sound and it plays well, great..... ...but nip up the tuner buttons half of them are hanging out. The stamp model may be erroneous, but it's that hand inked serial # that has me perplexed. Maybe a stock number???? not sanded off? Strange there's no label, who knows? Westbone wrote: Strange there's no label, who knows? 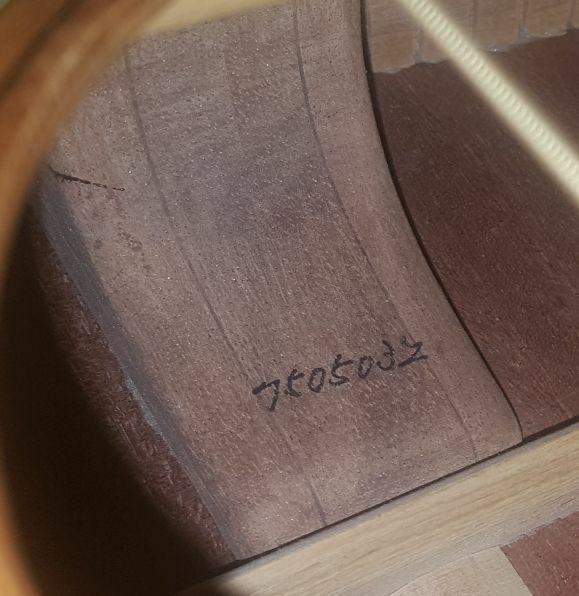 ..... those labels do fall off over time; my Vantage acoustic has no label left - you can see where it was but there is a number stamped into one of the ribs. 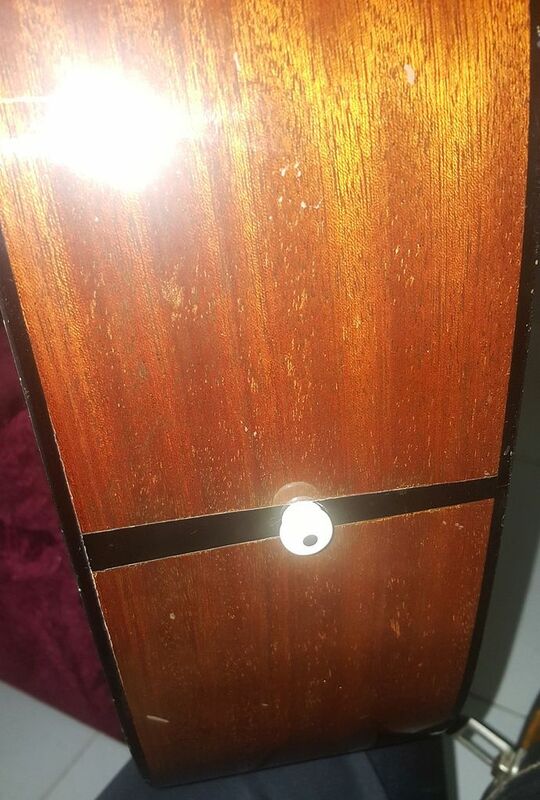 The label on a 2013 Epiphone Wildcat I have is hanging on by a thread. I didn't realize that Grovers were that old, interesting. Never associated Grovers with Mat. Good point Chad. 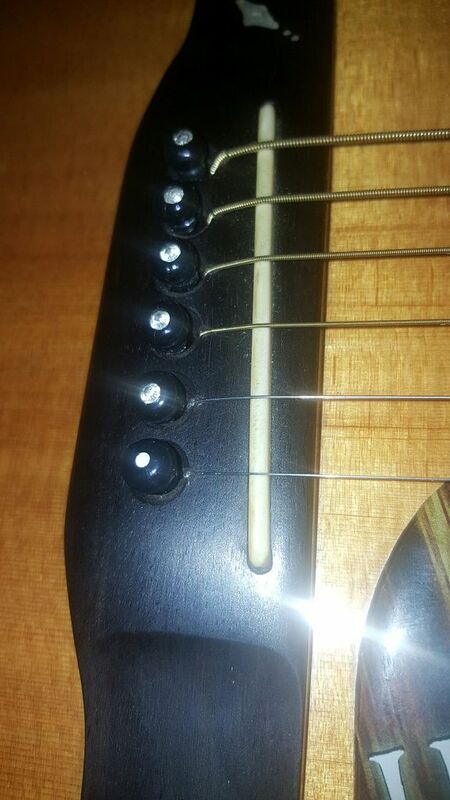 Looking at pictures of the other guitars in this and other series the heads are typically fastened with two screws. These single screw machine heads appear to be original. So we're back to my original question, "In what year was this made?" I'm starting to think this may be a 1987 build, possibly post Mats. 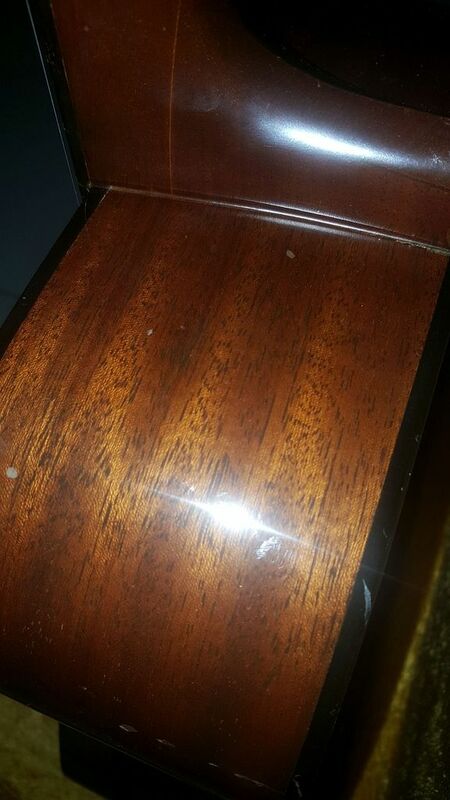 i would guess that guitar was made in the mid 70's. the very plain shape of the peghead matches other models known to be of that time period. the one on the website that looks most like it would be the > MW20 < notice in the pic that the label is peeling at one corner, which makes me think it not unusual that labels might have been lost. that new logo style was the first one that was a registered trademark, the online record indicates first use in commerce is Oct. '75. trademark protection was given in Aug. 1976 to Matsumoku. later transferred to SLM and eventually cancelled as of Oct '88. "Curious-er and curious-er!" said Alice. Despite it all that serial number just doesn't fit what we know about the 70's format.